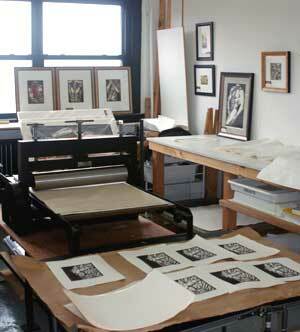 I am an artist/printmaker living and working in the Rochester, NY area. I received an undergraduate degree from The Museum School of Fine Art and Tufts University in 1983. In 1992, I received my MFA in Imaging Arts from the Rochester Institute of Technology. I have spent much of my work life supporting the electronic prepress world of the likes of Xerox and Kodak, while still maintaining the practice of making and exhibiting my artwork. Much of my art is representative of my dark-humored, fantasy view of life. It draws inspiration from pop culture, such as comic books (which have been a lifelong love of mine), the internet (with its wealth of pictures of anything you can imagine) and traditional art (always inspiring). My media of frequent choice is a linoleum cut technique, using oil-based printing inks. A linoleum cut is a relief printing process with linoleum as the medium rather than the more traditional wood. It offers me the graphic edge that characterizes my style. I then finish certain pieces with watercolor handwork for the addition of bright, intense color to the prints. Editions are limited to fewer than 250 due to the labor-intensive, individualized process of hand-painting each piece. This allows each piece in the edition to be unique and I enjoy the attention and variety I am able to give each print. There is no goal to make every print in an edition identical—indeed it is quite the opposite—I find my audiences also become interested in the variations they see with their own personal preferences playing into their final choices. I hope you enjoy and can relate on some level to my work. Feel free to send me comments: alan@alanlamont-art.com. Check back regularly for exhibit schedules and new work posted for sale. If you want me to notify you of any upcoming shows or events I am exhibiting in, please email your name, address, phone number and email address. Thanks and don't be afraid to laugh! I have a studio in the Hungerford Building in Rochester. It is located at 1115 E. Main St., Rochester, NY 14609. My studio is shared w/ Jill Kolartchyk, a friend and fellow artist. It is located on the 3rd floor and is studio #337. It is open by appointment only. First Friday (Rochester, NY) is a monthly citywide gallery night that encourages collaboration between non-profit, university, and commercial art venues in Rochester, New York. This initiative showcases area artists and arts institutions by promoting the First Friday evening of each month from 6-9pm as a community night for experiencing art. First Friday ensures a healthy art scene and a healthy city through regular exchange and discussion between venues, artists and patrons. My studio in the Hungerford building is usually open most 1st Fridays of every month, unless I am out of town. The studio is through Door 2 of the building on the 3rd floor at #337.